5-Methyl-1,2,4-triazolo[1,5-a]pyrimidin-7(4H)-one, an intermediate product in the synthesis of the antiviral drug Triazid®, was obtained for the first time by condensation of 3H-1,2,4-triazol-5-amine with ethyl acetoacetate in the presence of a catalytic amount of ZnCl2 in supercritical carbon dioxide (200 bar) under solvent-free conditions. Depending on the temperature and reaction time, the conversion was 90%. Russian Text © A.V. 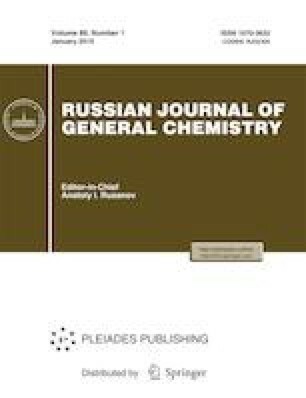 Baklykov, G.L. Rusinov, V.L. Rusinov, V.N. Charushin, D.S. Kopchuk, G.V. Zyryanov, G.A. Artem’ev, 2019, published in Zhurnal Obshchei Khimii, 2019, Vol. 89, No. 1, pp. 140–142.